Who Can Provide ISO-Tank Dray Delivery Service? WHY IT MATTERS TO YOU..
You’re halfway through prepping the turkey for Thanksgiving Dinner at 11:00 am when the phone rings: “We got a problem, boss,” are the first words that you hear. You inquire as to what the nature of the problem is that’s important enough to warrant an interruption of your family time. Try Hours is a family-owned and operated transportation company specializing in Ground Expedited Premium service. “We guarantee pick-up in 90 minutes and delivery within 15 minutes of the quoted schedule,” said Dave Wojkiewicz, Vice President of Sales. Wojkiewicz added, “we guarantee “exclusive use,” meaning that only YOUR freight will be on the truck and the truck will not stop until it reaches your destination.” Having specialized in the movement of time sensitive and emergency freight since 1989, Try Hours provides ground expedited service to the industrial manufacturing sector to and from all points east of the Mississippi, from Minnesota to Texas as well as California. 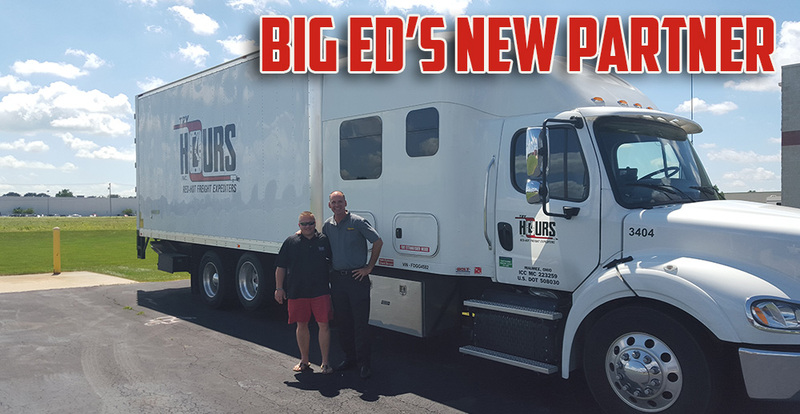 BIG ED will offer his expertise to help expand the business opportunities along the east coast. Try Hours offers a specialized service; they’re in the “oh crap…we have a major problem solving business,” said BIG ED. Try Hours partnership with Burns Logistics Solutions, Inc., will lead to myriad new business opportunities and the knowledge that you will feel great knowing that these two industry-leading experts know how to handle your freight-and more importantly get it there on-time, every time.